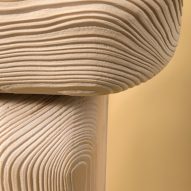 German designer Lisa Ertel used a sandblasting technique on wood furniture to emphasise the patterns created by trees' annual rings of growth. The Dune collection, which was shown during Milan design week, is intended to highlight the "individual history" of each piece of wood, making it more of a tangible experience. By removing the soft new wood on the outside, the underlying shapes of previous years are revealed. The resulting patterns are reminiscent of topographic maps. "Through the dialogue between naturally grown wood and the input of industrial process, the family manages to look completely new, but seems familiar at the same time," said Ertel, who created the furniture as part of her final year studying Product Design at the Karlsruhe University of Arts and Design. In 2014, a furniture and accessories collection released by online platform New Window also experimented with the possibilities of sandblasting wood, removing outer rings to leave thin gaps. 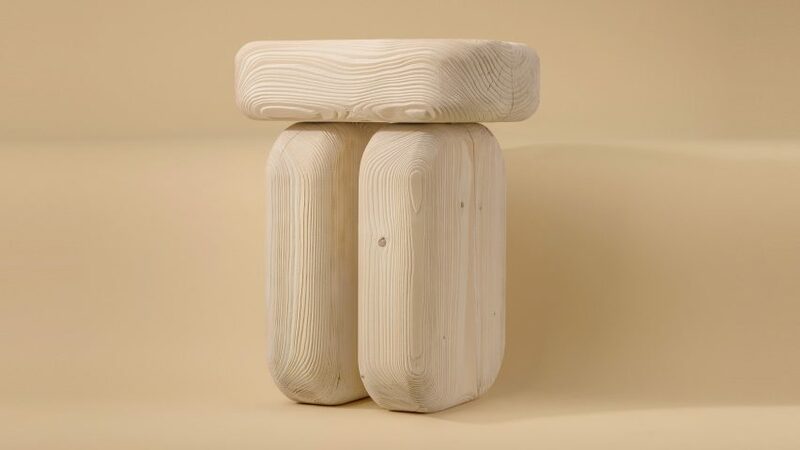 For Dune, Ertel designed purposefully chunky stools, benches and chairs from solid slabs of wood. Their style references resting places found throughout Germany that date back to the 16th century. 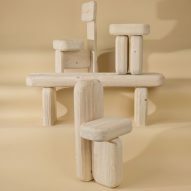 Intended as a spot for travellers and farmers to put down heavy goods, the benches – known as ruhstein – feature similarly simple forms, often made of just a few beams. Ertel's pieces range from seats small enough to hold in one arm to benches long enough to seat several people at once. The Dune collection was shortlisted as part of the ein&zwanzig award by the German Design Council – which showcases promising designers from around the world. Other furniture highlights during Milan design week included an asymmetric take on the classic Thonet bistro chair by Swedish studio Front and a collection of triangular-patterned pieces designed by Danish-Icelandic artist Olafur Eliasson. Photography is by Michelle Mantel.